IMAGE: Prime Minister Narendra Modi with his Thailand Counterpart General Prayut Chan-o-cha after a joint press statement in New Delhi on Friday. India and Thailand on Friday decided to ramp up cooperation in the fields of economy, counter-terrorism, cyber security and human trafficking, besides forging closer ties in defence and maritime security. The announcement was made in New Delhi after Prime Minister Narendra Modi held extensive talks with his visiting Thai counterpart General Prayut Chan-o-cha. The leaders said early conclusion of a balanced Comprehensive Economic and Partnership Agreement is a shared priority. Modi said both the countries have prioritised completion of India-Myanmar-Thailand Trilateral highway and early signing of the Motor Vehicles Agreement between India, Thailand and Myanmar. Following the delegation-level talks, in which also Army Chief Dalbir Singh Suhag was also present, two agreements -- Executive Programme of Cultural Exchange (Extension of CEP) for 2016-2019 and a Memorandum of Understanding between Nagaland University and Chiang Mai University, Thailand -- were signed. In a bid to attract tourists from Thailand, especially to the Buddhist sites in the country, Modi announced that India will soon facilitate double entry e-tourist visas for Thai citizens. Talking about the issue of terror, the prime minister said both countries were aware that rapid spread of terrorism and radical ideology pose a common challenge. In our shared objective to combat these challenges, India is particularly grateful to Thailand for its assistance and cooperation, he said. “Beyond terrorism, we have agreed to further deepen our security engagement in the fields of cyber security, narcotics, transnational economic offenses and human trafficking,” Modi said while addressing the media. Noting that India and Thailand were also maritime neighbours, he said both the countries have agreed to forge a closer partnership in the fields of defence and maritime cooperation. “A partnership to meet our bilateral interests and to respond to our shared regional goals,” he said. On trade and commerce, Modi said a more ‘diversified commercial engagement’ between both countries would not only benefit the respective economies but also enable greater regional economic prosperity. He said that besides trade, there are also ample avenues for greater manufacturing and investment linkages. “We see a particular synergy between Thai strengths in infrastructure, particularly tourism infrastructure, and India’s priorities in this field. “Information Technology, pharmaceuticals, auto components and machinery are some other areas of promising collaboration. We also see early conclusion of a balanced Comprehensive Economic and Partnership Agreement as our shared priority,” he said. The Thai prime minister said when it comes to comprehensive economic and partnership agreement, both countries should focus on what can be done first. Modi said both the leaders are fully aware that smooth flow of goods, services, capital and human resources between the economies needs a strong network of air, land and sea links. “Connectivity is also an area of priority for India’s development. Improving access to Southeast Asia from our north-eastern states benefits both our peoples,” he said. Stronger connectivity is essential not just for expanding bilateral trade ties, it also brings people closer and facilitates enhanced science, education, culture and tourism cooperation, he said. Modi also announced that the Indian Constitution will soon be translated into Thai language. A joint statement released later said that in addition to the wide range of cooperation, Thailand and India have compatible strategies of Look West and Act East respectively that has been now evolved into a comprehensive partnership. The two prime ministers held wide-ranging discussions on bilateral, regional and multilateral issues, with a common goal to work closely towards the 70th anniversary of their diplomatic relations and beyond, it said. Both the countries recognised the importance of bilateral trade and noted that the economic relations are deep rooted in the existing framework, including bilateral Free Trade Agreement, Association of Southeast Asian Nations India Trade in Goods Agreement and Early Harvest Scheme, the release said. Modi welcomed Thai investments in India in the potential areas under the 'Make in India' initiative, especially in the manufacturing sector, infrastructure development, tourism and hospitality facilities. He said Thai companies will invest in the development of the Buddhist Circuit and construction of five high-end hotels. “The prime minister of Thailand invited Indian investments to Thailand under the cluster development policy, which is a newly initiated program aimed at enhancing investment in focused areas,” a joint statement said. The policy will help expand the investment network between the two countries in various mutually beneficial sectors, including information technology, pharmaceutical, automotive parts, chemical products, machinery and parts, bio-technology, and research and development, it said. The Food and Drug Administration of Thailand and the Central Drug Control Organiser of India agreed to cooperate in the area of pharmaceuticals. 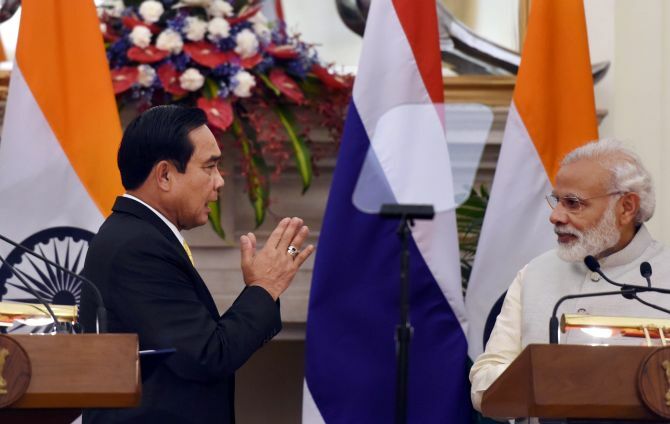 Modi welcomed the suggestion of the Thai prime minister to help train Thai youth in information technology in India. Both sides expressed a keen interest in enhancing cooperation in maritime domain, including anti-piracy cooperation, security of sea lanes of communication, coast guard cooperation to maintain peace and ensure safety and security of navigation in the Indian Ocean, the statement said. In this connection, both sides agreed to work towards the completion of the negotiation for the signing of the White Shipping Agreement between the two countries. Thailand expressed interest in the Indian defence industry and its experience and expertise in the field of defence R&D and production. Both sides acknowledged the increasing threat from non-traditional security arenas and agreed to enhance substantive cooperation for action in this regard. The countries pledged to cooperate in tackling terrorism. The two leaders welcomed the progress made in the agreements on cooperation in controlling Narcotics, Drugs Psychotropic Substances, their precursors and Chemicals and Drug Abuse, it said. They agreed that close cooperation and more agreements between India and ASEAN and Mekong Sub-region are significant for the fight against illicit drugs and precursor chemicals trafficking in this region. The two PMs noted the ongoing negotiation of the MoU for cooperation between Thailand Computer Emergency Expert Team and Electronics Transaction Development Agency and Department of Electronics and Information Technology of India. Both sides welcomed the initiative for joint combined counter-terrorism exercise between the Counter Terrorist Operations Center and the National Securities Guard; and the training of Thai officers by India's Central Bureau of Investigation in cybercrime investigation and computer forensics, the statement added.